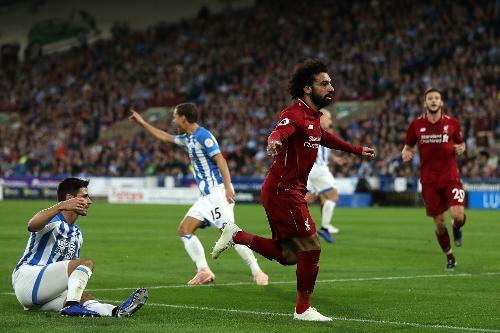 Mohamed Salah’s first goal in five club appearances ended Liverpool’s four-match winless run in a valuable 1-0 victory at lowly Huddersfield Town on Saturday. Egypt star Salah netted his 50th goal in English football midway through the first half to move his side two points ahead of former club Chelsea and level on points with Manchester City atop the Premier League. The classy finish offered relief for Liverpool after consecutive blanks against Napoli and City prior to the international break, but there was to be no similar salvation for goal-shy Huddersfield, who are scoreless in each of their five home league matches this term and still without a desperately needed victory. While David Wagner’s men are sinking deeper into danger, close friend Klopp can be satisfied with a professional performance secured without several first-team regulars. Robbed of the injured Sadio Mane and with Roberto Firmino on the bench, Liverpool’s possession lacked a threatening edge until the 24th minute. The absences afforded Xherdan Shaqiri his second Premier League start and the midfielder responded with a well-weighted pass from which Salah poked in the opener. Jonathan Hogg soon rattled the left post with a sweet half-volley before unsuccessful penalty appeals for handball and a disallowed finish from an offside Alex Pritchard heightened Huddersfield’s sense of injustice. Klopp, having removed Jordan Henderson at half-time due to reported hamstring tightness, would have been able to relax had Salah not dragged wide of the far upright shortly after the hour. Fabinho was introduced for his Premier League bow off the bench and, though the contest remained in the balance until the end, the visitors were composed in seeing out a seventh league win, their only real scare a fluffed Steve Mounie finish in the 82nd minute. Having watched helplessly as injury issues arose regularly during the international break, Reds boss Klopp will have been heartened that a side featuring Shaqiri, Daniel Sturridge and the fit-again Adam Lallana demonstrated winning know-how. Dragged off after 45 minutes of his league debut for Liverpool last month, Switzerland star Shaqiri made use of a second chance, with his touch of class to unlock the stubborn Terriers defence the standout moment of a fine performance. In a match of fine margins, Christopher Schindler’s brief lapse in letting Salah find space for the winner proved costly. Liverpool entertain Red Star Belgrade in the Champions League on Wednesday before a weekend visit from Cardiff City, while Huddersfield host fellow strugglers Fulham a week on Monday and surely need a win.